A young couple attempt to quell their parents' matchmaking interests by faking an engagement in Hallmark's HITCHED FOR THE HOLIDAYS (2012). 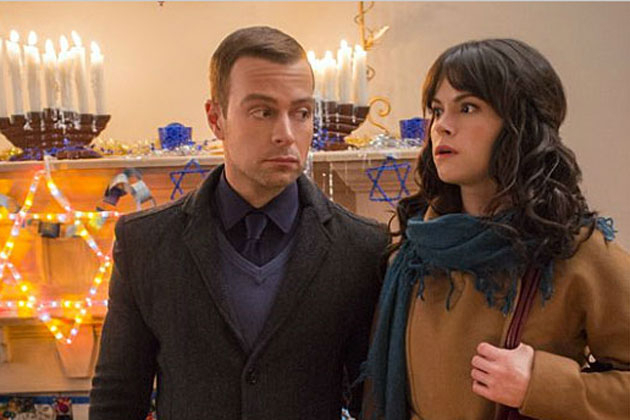 Rob (Joey Lawrence) and Julie (Emily Hampshire) are tired of their parents meddling in their love lives, especially at the holiday season, and after connecting on a dating website they make a pact: They'll attend all of each other's family and work parties during the last few days of the year, posing as each other's "significant other," then go their own ways after New Year's. For Rob the need for a girlfriend is particularly acute, as he wants to make his (apparently) dying grandmother (Paula Shaw) happy, knowing that he won't be alone after she's gone. The plan initially comes off well, though not without some bumps; while Julie immediately tells Rob's Catholic family she's Jewish, Rob pretends to be Jewish when he's with Julie's family -- with some rather comical results. Eventually the truth comes out, but at the same time, Rob and Julie have developed real feelings for each other during their time together. Can this fake engagement be saved? As is sometimes the case with Hallmark films, the story seems to have roots in an earlier film; in this case I wondered if script writer Gary Goldstein had seen IT STARTED WITH EVE (1941), in which Bob Cummings produces a fiancee, Deanna Durbin, for his "dying" grandfather, Charles Laughton. This Hallmark film is a few years old and I found it slightly edgier and darker than Hallmark films of more recent years. For example, early on the hero gets drunk; the hero's parents invite the ostensibly engaged couple to share a bedroom; the hero's mother had emotional troubles when he was young and would leave the family for periods of time; and the couple at times took their lies just a little too far for comfort. None of these things are earth-shattering but the combined effect made the film just slightly less family-friendly than other Hallmark films I've enjoyed. Overall, I thought it was worth seeing, though it was a little more dramatically tiring than I prefer in a Hallmark film (grin). 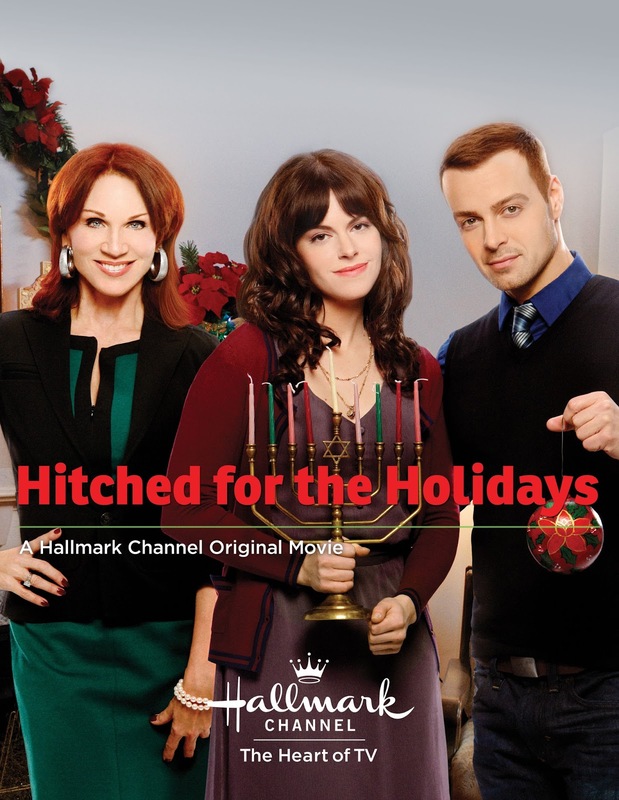 For that reason I rank it on the lower end of Hallmark films I've seen to date. 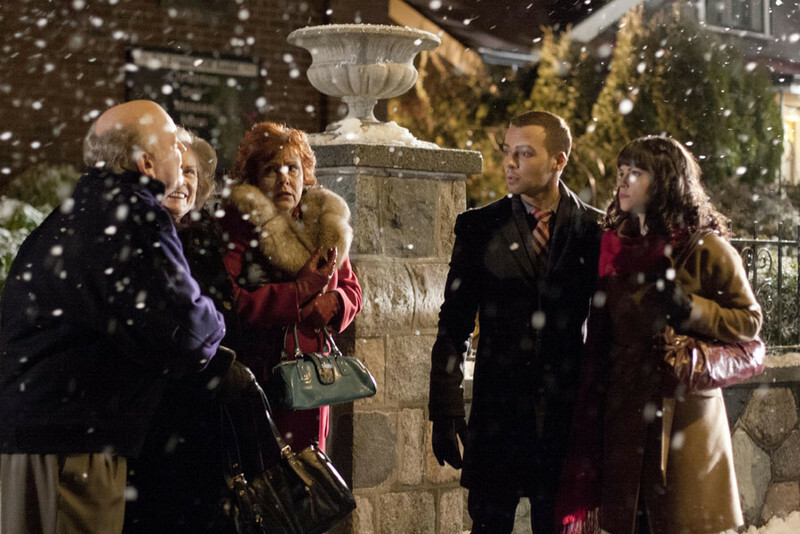 Marilu Henner, currently appearing in Hallmark's Aurora Teagarden Mysteries, plays Julie's mother. Additional familiar Hallmark faces show up in supporting roles; Kevin O'Grady of the Garage Sale Mysteries series plays a hulking sportswriter at Julie's office, and Lisa Durupt of the Murder, She Baked series plays Julie's friend. HITCHED FOR THE HOLIDAYS was directed by Michael Scott. It was filmed by Adam Sliwinski in British Columbia. Fun trivia: I wasn't familiar with Joey Lawrence and was amused to learn that as a child actor he voiced the title role in the Disney cartoon OLIVER & COMPANY (1988). 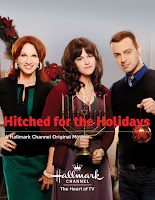 HITCHED FOR THE HOLIDAYS is available as a single-title DVD or in a four-film collection. A digital copy may be purchased from Amazon Instant Video. Excellent review here, Laura. This movie does have some ups & downs. The first time I watched it, I laughed all the way through, but after giving it some thought, and getting feedback from others, I found some people were turned off by the characters denying their faith. It makes me feel awkward, too, while watching the movie, to see them pretend they are one faith, and not another. The scene where the cross is taken down and is essentially tossed on the floor in the closet is the worst. I wanted to love this movie, but it just always gives me a different feeling now. 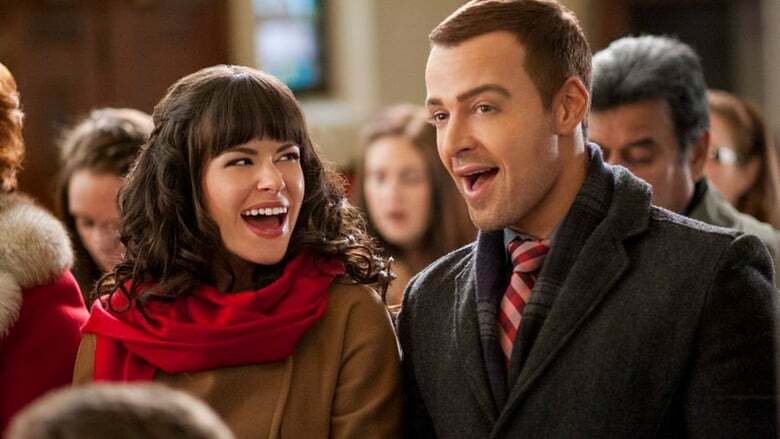 Joey Lawrence, who I've always liked since his child acting days on Gimme a Break, is wonderful in it, such great fun, but your right, Laura, it's just not up to the usual Hallmark standard. While I chuckled over the scenes with Lawrence attempting to act as though he knew what he was doing celebrating a Jewish holiday, I think you make a good point. The two lead characters taking their respective religious faiths so lightly contributed to the film's overall "edgier" feel and made them seem a little less admirable. Lying works in some films, especially if handled with just the right light or thoughtful touch -- IT STARTED WITH EVE, mentioned in my review, is a good example, or WHILE YOU WERE SLEEPING (1995) -- but the sum total of everything going on in this film simply made it more questionable. I enjoyed it but it's not one I see myself returning to with regularity, especially given so many other good Hallmark options.